The Cheyenne Urban Forestry Division, along with local arborists, are observing an uptick in the number of dead and dying spruce trees in Cheyenne as a result of the spruce ips beetle. This beetle was first identified in Cheyenne about a year and a half ago, and appears to be building in population. The ips beetle infests only spruce tree varieties, such as Colorado Blue Spruce, Black Hills Spruce and Engelmann Spruce. Other evergreens, such as pines, junipers and firs are not affected. Homeowners should be on the lookout for the tell-tale signs and symptoms of a beetle attack, which include red needles or loss of needles in the top of the tree; small round holes in the branches and trunk; and tunneling galleries beneath the bark. Once ips beetles are detected, damage to the tree is usually too extensive to warrant efforts to save the tree. Instead, tree removal is generally the best option. After removal, care must be taken to prevent the spread of beetles from the infested wood to living trees. Infested spruce wood with ips beetle larvae have the potential to infest live trees in the spring. 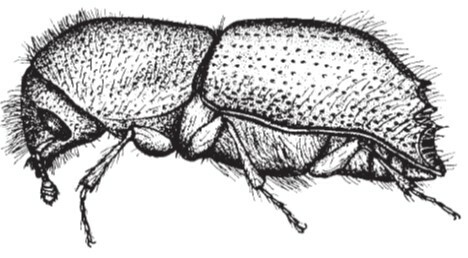 To help prevent this, all infested wood should be chipped, debarked, burned over the winter, or hauled to a remote location that is at least one mile from any living spruce trees or hauled to the City Compost Facility (trunk sections larger than 12 inches in diameter are not accepted). Homeowners with spruce trees, especially older or stressed trees, may consider hiring an arborist to spray a preventative insecticide to the trunk and larger branches to prevent ips infestations. Ensure the arborist has the proper equipment to apply the insecticide to the very top of the tree. Two insecticide treatments, one in early spring and one in mid-summer, are generally recommended since ips beetles have multiple generations per year. Trunk injections may be considered, although research to support their effectiveness is still in ongoing. 1. Slowly water the area from the trunk out to the end of the branches once per month during the winter. 2. Mulch around the base of trees with wood chips or bark to a depth of 2 inches (especially important for young trees). 3. Slowly water the area from the trunk out to the end of the branches every 7-10 days during the summer and fall at a rate of 10 gallons per inch of stem diameter. 4. Hold off on pruning any branches until winter. • Spruce ips beetle prefers weakened or unhealthy trees and typically attacks the tops of trees and the branches first before moving into the main stem. 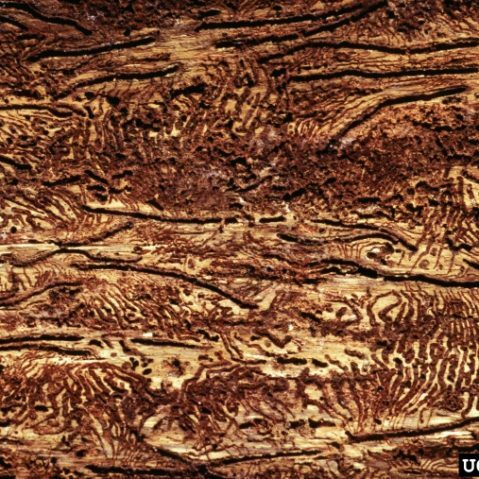 Unlike mountain pine beetle which will attack and kill a tree in the same year, ips beetle usually takes multiple years to kill a tree. • The increase in ips beetle is likely the result of the high number of declining spruce trees that are present in Cheyenne. This decline is the result of recent drought, the November 2014 hard freeze and multiple hail storms over the past several years. This combined with an ageing population of spruce has resulted in a tree population that is susceptible to beetle attack. Also, newly planted spruce trees and spruce that have incurred recent damage to the roots, stem or branches are more susceptible to attack. • Typically, an ips beetle attack occurs first in the upper portions of the tree which results in the needles turning red. Small round holes in the bark, boring dust in bark crevices or around the base of the tree and tunneling galleries beneath the bark indicate the presence of ips beetle. Woodpecker activity in the tree can also indicate a beetle infestation. If any of these conditions exist, an arborist should be contacted to confirm the presence of ips beetle. • Insecticides which contain the active ingredient permethrin, bifenthrin, or carbaryl have proven effective. Trunk injections may be considered, although research to support their effectiveness is still in progress. 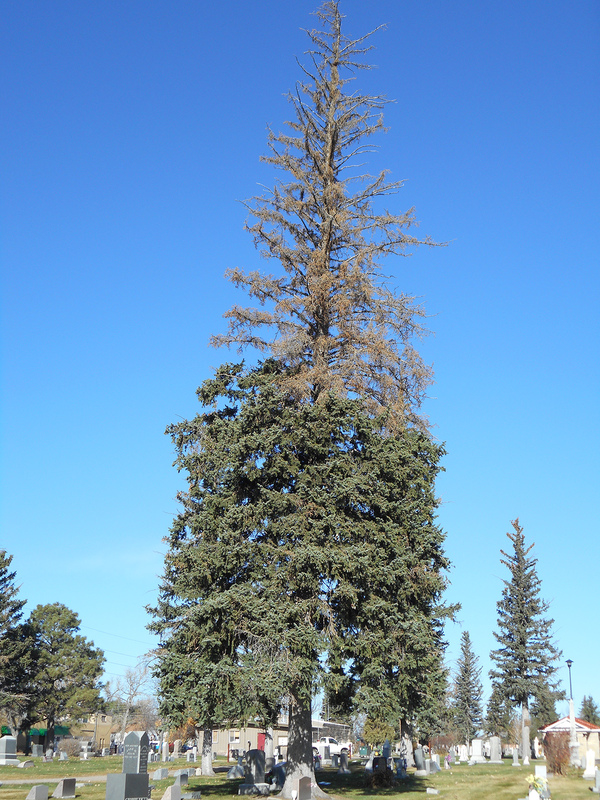 • To get more information on the spruce ips beetle go to Colorado State University Extension: http://extension.colostate.edu/docs/pubs/insect/05558.pdf or contact the Cheyenne Urban Forestry Division at 637-6428. For more information or to download the list of licensed arborists for Cheyenne go to www.cheyennetrees.com. © 2017 West Edge Collective. All rights reserved.